In my family, you would be better off trying to skip Christmas dinner than one minute of the Stone Mountain Highland Games. 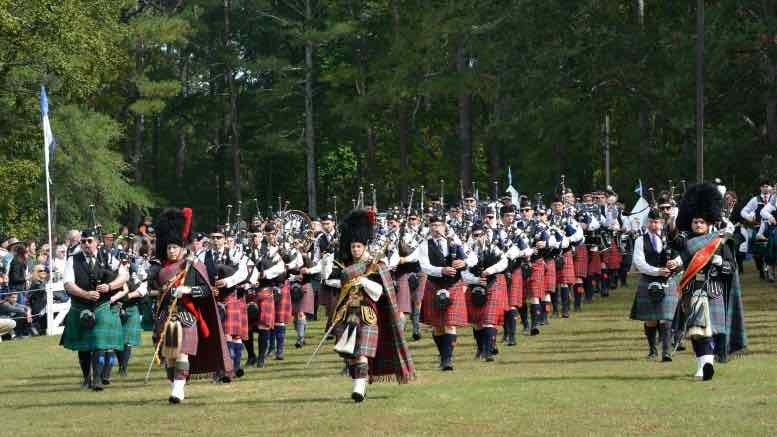 Every October we pilgrimage in our kilts and tartans to our beloved Stone Mountain Park for the annual Highland Games and all the Scottish festivities. This year’s event will be held on Oct. 20-21, 2018. Over the years, I have seen these games grow into one of largest Scottish heritage events in the United States. Don’t be fooled by the name though; there is so much more than just the traditional Scottish games, as if that were not enough! This year there will be over thirty pipe and drum bands competing and performing. If you have never heard a massed pipe and drum band, you just have not lived! Throughout the weekend each band will be judged individually for the overall competition, but best of all is the massed band performances that will make every hair stand on end. The performers are all talented and vested in educating the public about the tradition of Scottish music so don’t feel shy about letting the kiddos ask someone about their bagpipes or drums. If they aren’t in the middle of rehearsing, you’ll probably get the history of the pipes and a little show. A family favorite are always the dance stages where performers of all ages compete for ribbons and national standings. Scottish Highland dance has a long, rich history and is fascinating to watch. Despite the fact that it is a competition, the announcers make a point to explain the history and intricacies of each dance to the spectators. Just a warning: your little girl might be begging you for a pair of ghillies to stomp around in at home. If you want to cut a rug while you’re there, stop by the Royal Scottish Country Dance Society’s stage to pick up some new moves and join in the dancing. All ages are included and the children love the experience! Not to be missed are all of the wonderful Scottish animals! Dog-lovers be sure to catch the Border Collies demonstrating their sheep (and occasionally duck) herding skills. Scottish shepards developed an elaborate system of whistle commands to accurately coordinate teams of collies across open fields to keep their flocks safe and organized. Sheepdog demonstrations are on Sunday. Also keep an eye out as you walk through the festival for the hawk handlers. While you have your picture made with a trained red-tail hawk you can hear about how this group keeps the tradition of trained hunting hawks alive right here in Georgia. One aspect that makes the Highland Games such a family-oriented event are all the Scottish families, which we call clans. Each clan is comprised of multiple family surnames (septs). As you move past the parade grounds and into the wooded area of the grounds, all of the clans have tents arranged along the pathways. At the front of clan tents, there will be a genealogy tent where you can look up which clan your family may hail then find your clan tent. Visit your clan tent and meet the members for the best kind of games experience. Everyone is warm and welcoming, especially to new-found “family” members! Each clan has its own history and traditions which they will have represented at their tent. If you already know your clan affiliation or research it ahead of time (check ScotClans), then you’re in for a real treat. For the insider’s experience, bring a dish to share and drop by your clan tent before lunch to get invited in for a buffet! Maybe even try your hand at a traditional Scottish recipe (check rampantscotland.com/recipes). Don’t want to cook, but plan to stay for lunch? No worries, there is plenty of traditional Scottish fare to sample! Naturally I would encourage everyone to try the haggis because you just have to eat it once in your life, but honestly…even most of us don’t touch the stuff outside of a Burns Night dinner! Not to fear however, the fish and chips (chips = french fries, not actually chips) are terrific and you can also find one of my very favorite Scottish dishes, a bridie. These are a perfect option for children. A bridie is a savory meat and vegetable pie similar to a hot pocket. They are easy for little hands to hold without making a mess. Then as soon as you’ve eaten your lunch run, don’t walk, to the pastry tent at the back of the shopping area! The sweetest little Scottish ladies have spent days baking their favorite treats. I always go home with a bag of goodies to get me through the subsequent depression I feel at the end of the games each year. If you’re visiting in the morning, be sure to stop here for some coffee or tea and a nibble for breakfast. Since you’ve picked up a treat to occupy the children and you’re in the shopping area, take some time to peruse the wares. You can find beautiful tartan scarves and sashes in your tartan if you’ve discovered your Scottish heritage. There are plenty of toys and novelties for the kids, lovely Scottish home decor items, jewelry, books and best of all, imported food stuffs that are difficult to find stateside! I personally stock up on PG Tips Scottish Breakfast tea – the most delicious way to start your day and remind you of your visit. There is a great variety of British candies that are fun stocking stuffers. If you need a gag gift or play a white elephant (dirty santa) game during the holidays, I highly recommend the canned haggis for a laugh. And of course the games! Many of you may not realize that the traditional Scottish Highland Games are serious competition where the athletes are sponsored and contend for national and international standing. While you may be familiar with the most famous event, the caber (Gaelic for tree because it is!) toss there are many more events such as the sheaf toss and hammer throw. Kids of all ages will be completely enthralled watching these athletes heave full trees across the fields! So when the tots say they want to try let them! Back in the wooded area of the festival grounds you will find a great variety of supervised children’s activities including “Stirling Bridge,” a pint-sized version of the adult games complete with mini cabers which is just a riot to watch! Even the adults can get in on the action at a clinic given by the athletes Sunday morning where you can practice your throws too. Right by Stirling Bridge you can find all sorts of other children’s activities. There will be a Loch Ness obstacle course, face painting and Scottish themed crafts such as sporrans or tartan placemats. In the vicinity, you can check out all sorts of different Celtic musical stylings from Scottish rock and roll to harp and and even Scottish country music. Parking is easy to find and plentiful. There will be signs and people guiding you in all the way from the park entrance. You may have a bit of walk though so dress comfortably and come prepared for the kids. Little red wagons are a preferred form of transportation. The mornings are sometimes cool so dress in layers as it may get warm later if you’re in the sun watching the events. Stone Mountain Park will be providing shuttle service to all of the outer parking lots in the park. The service will begin 10:00 am and run though out the day. Pick up and Drop off will be located close to the new pedestrian entrance (the Old Front gate). More Traffic control has been added to assist you in finding a parking space close to the service. The last shuttle to the outer parking lots will leave the Games area at 5:45 pm. We are very excited about this new service we can offer our visitors. This post was contributed by By Miranda Haley. Photos provided by Stone Mountain Park. 3 Comments on "Insider’s Guide To The Exciting Stone Mountain Highland Games"
Love the highland games! Love the pictures. Only disappointment was not being able to hear the massed bands. I was a patron for a few years of the highland games at Loon Mountain – Woodstock, NH. To hear 30 or so massed bands playing Scotland the Brave, is a very moving experience. Oh well – don’t get me started. Thanks for putting the video up! This was so helpful as I took my children (4.5, 7) to the games this past weekend. It was my first time, too, after being in Atlanta for 23 years. We all had a great time. While the official website offers a schedule, this article gives personal pointers. I even found my cup of hot tea for a mid-afternoon caffeine kick at the booth selling baked goods. The children’s area has so much to offer. Santa was even there for pictures! All the volunteers were so nice, and the volunteers for the children’s section were amazing! I just wish the mass pipe band performance at noon lasted longer. That was my favorite part. I’m so glad it was helpful Stephanie! If you have any additional tips, we’d love to hear them.